Living in a Tamale World cuz I am a Tamale Girl: June 2011 :: Bites on Broadway, Ignite! Expo and other Tamalerific Events TBA! June 2011 :: Bites on Broadway, Ignite! 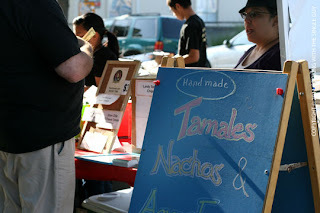 Expo and other Tamalerific Events TBA! So it looks like summertime in Oakland has finally arrived! Long weekends, graduations and Friday special events need those special treats like tasty tamales, nachos made with lardy chips and thirst quenching aguas frescas! I'm still nailing now the details for many of the special events the Tina Tamale food booth will be at...por please check back for updates. We will be at select dates for this ongoing food pod in the Temescal/Rockridge area. Mobile food & games for kids of all ages. Kudos to organizer Karen Hester for making a lonely sidestreet on Broadway full of life, food, fun and at the debut...long lines! As I told a friend, "It was good and bad...good: we sold out in just over two hours, bad: we sold out in just over two hours!" My next generation staff and I promise to be quicker and have LOTS more tamales & aguas frescas this coming Friday, June 17th. The Ignite! New Business Expo is the only event that launches and celebrates micro-businesses within our local economies. It began in 2006 to help Urban FIRE, Oakland's homegrown entrepreneurship program, give its graduates an opportunity to showcase their new businesses, and it has grown each year to become the largest expo of its type. WAIT! We're not a new business you say...(mumbling) you read somewhere that our family biz was founded in 1944. OK, you 're right, sort of, Tina Tamale (the brand, not the person) just launched as the special order/event brand at La Borinqueña AND the man behind the fire, Boku Kodama, has asked for a few of us "anchor" local, indie businesses to help out and show the new kids/public that longevity is possible! Find our tamales, chips, salsa fresca & aguas frescas at this midday event.